Another hit and run. Yep, someone came too close to my car again and scraped off the side mirror. No note, just a broken, shattered mirror. Did I mention that my car was parked? This is my third hit-and-run in the last two years, all of which happened while the car was legally and to all appearances safely parked. Not to belabor the point, friends, but my car wasn't even moving. 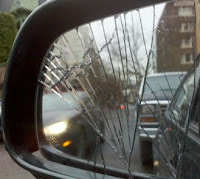 Until I can get it fixed, what's behind me shows in a cracked mirror. I don't worry too much about what's behind me, though. The car only seems to get hit when it's not moving. This has only happened to me in this city. Hmm.